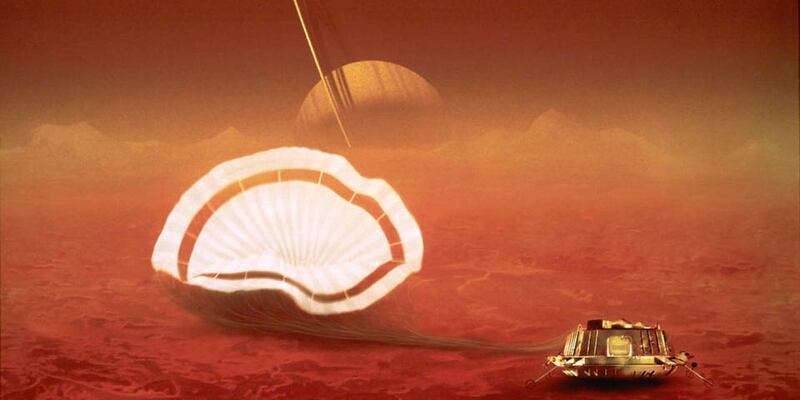 My name was flown on the Cassini Huygens mission to Saturn and soft landed on the great moon Titan. 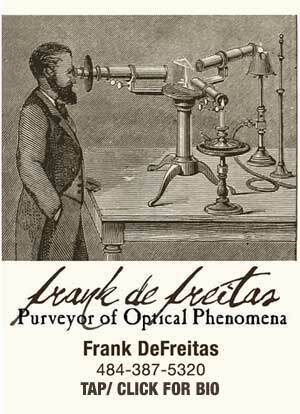 the name of a holographer from planet Earth . . .
sitting on the surface of Saturn's great moon Titan. "I create three-dimensional laser holograms on Earth." In late 1996 and early 1997, a CDROM was being created by the European Space Agency (ESA) to be included on their Titan lander, Huygens. It would contain peoples' names, sounds, art works, personal messages and general ephemera from Earth. I am one of the few people who had their personal information digitized onto this disc and sent to Saturn. 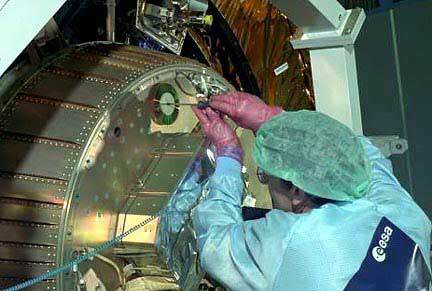 The photo above shows one of the the ESA workers attaching the CDROM to the Huygens lander probe. Huygens would hitch a ride to the planet Saturn by Cassini -- a Saturn orbiter craft that still continues to transmit data back to Earth (as of year 2015). The pair were launched on October 15, 1997. Huygens separated from Cassini on December 25, 2004, and successfully soft-landed on Titan on January 14, 2005. It is the first space craft to make a landing in the outer solar system. 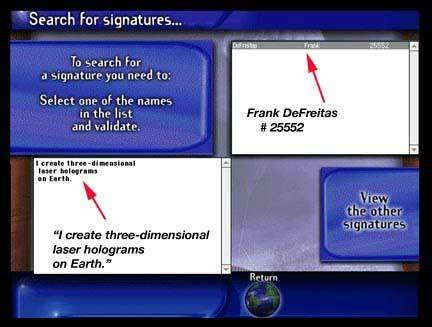 (above) My message on the optical disc contained my name: Frank DeFreitas; my assigned number: # 25552; along with these words: "I create three-dimensional laser holograms on Earth." 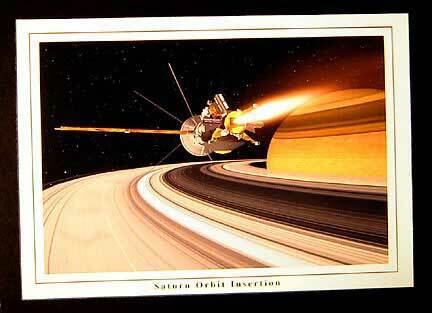 (above) A postcard in my Cassini-Huygens ephemera collection (one of 8 in the series) that shows the atmospheric probe being released by the orbiter craft; (right) a copy of the master CDROM in my collection, provided by the European Space Agency. It contains all data that was sent to Saturn / Titan aboard Cassini-Huygens. (left) an artists' rendering of the probe as it sits today on the surface of Saturn's moon Titan, using available data as to what it would actually look like. The CDROM is encased in a protective vacuum within the craft; (right) one of the many surface photos transmitted back to earth of the environment surrounding the lander. It is very exciting to know that one's name is sitting on the surface of another celestial sphere in the heavens. Far in the future, this time capsule is to be rediscovered by planetary explorers. 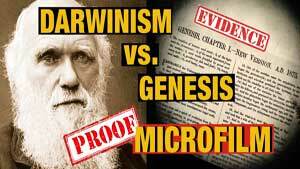 It is anyone's guess as to when, or even if, that will ever happen. 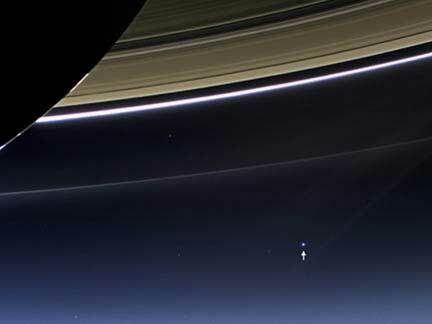 However, in the meantime, I continue to look up every now and then, when Saturn is high in the sky, and wonder. 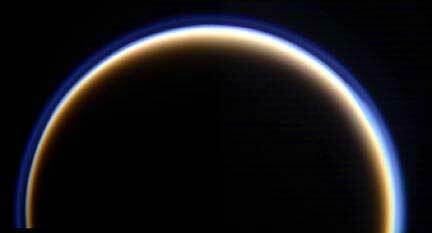 In closing, it is my hope that one day explorers will return to Titan, and that they will remember the Huygens mission from the 20th / 21st century. If the pressurized and hermetically sealed CDROM survives, they should have a working knowledge of digital recording systems to access the stored data. If they do, I hope that they will be curious enough to find out more information about the person who was listed as creating three-dimensional laser holograms on Earth. Most importantly, the work of the last phase of my life: glorifying God our Heavenly Father, his only Son Jesus Christ, and the Holy Spirit that guides my work.